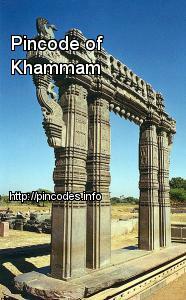 Khammam is the city in Khammam district of the Indian state of Telangana. It is the headquarters of the Khammam district, located in Khammam mandal. It is located about 193 kilometres (120�mi) east of the state capital, Hyderabad. On 19 October 2012, Khammam city was upgraded as municipal corporation, which includes 14 surrounding villages. The river Munneru flows on the western side of the town. It has been the head quarters of the district since 1953. it is also a divisional and taluk head quarters. It has a population of 2,84,268 as per 2011 Census with an area of 94.37 Sq. km. It has developed in to an important center of education with three Arts and Science Colleges and other educational institutions. The Government head quarters hospital and the MissionHospital provide higher order medical facilities to the entire region of the town. It is a trading centre for the agricultural produce of its hinder land. It is also an important commercial centre. A many as 15 school children were injured after the vehicle, carrying them met with an accident in Telangana`s Khammam District on Wednesday. Ten chilli farmers, who were arrested for allegedly vandalising the Khammam Agriculture Market Yard office on April 28, were produced in the court in Khammam town near here in handcuffs yesterday.